Do you want to get your business ranked in Google and all search engines? This guide has everything you need to know! 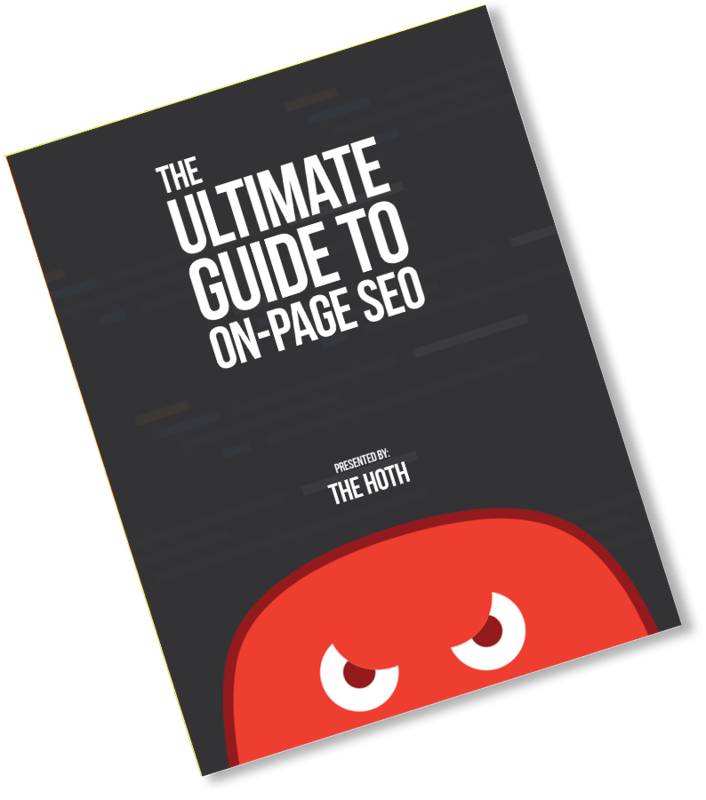 › What is On-Page SEO? › 3. What is High Quality Content? Looking to enhance the traffic to your website? This optimization guide is packed with insights and strategy for beginner-to-intermediate SEO practitioners looking to hone their current skills and get informed on the latest and best practices. We won’t push flashy tricks or a list of all the factors without clear instructions. 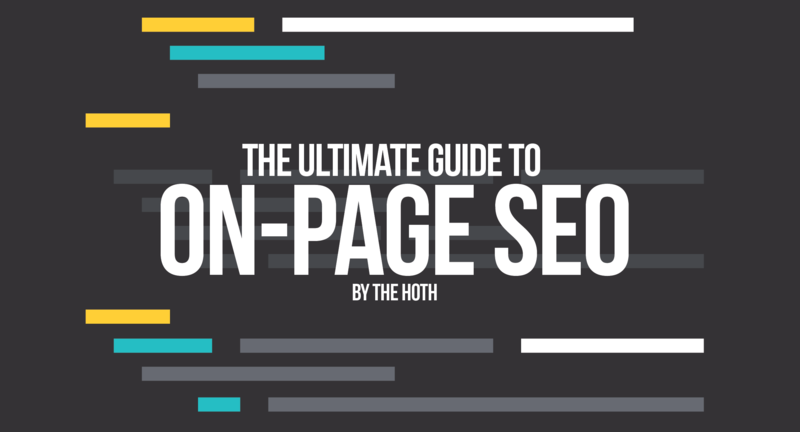 This resource gives you a strong foundation for on-page SEO and a comprehensive look at what to do to for each factor. What sets this guide apart is a step-by-step format for optimizing your website systematically and strategically. Whether you’re starting a new website or improving an existing one, your success is our goal. We’ll start with a bird’s eye view of the major factors and gradually zoom in on the more technical ones. First, we’ll introduce you to OnPage SEO. Next, you’ll optimize keywords and content. 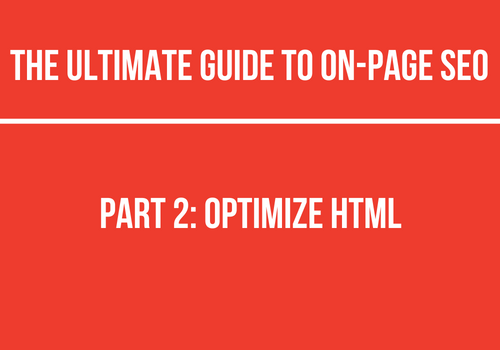 Then, you’ll optimize HTML factors on each page. 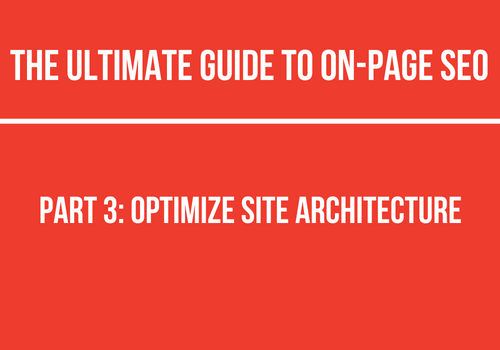 Finally, we’ll go through your site’s architectural factors. On-page SEO (also called on-site SEO) refers to optimizing multiple components within a website. The goal is to set up your site’s pages to land at the top of search engine results and capture more traffic. You affect the likelihood of this by optimizing the content, architecture and the HTML code of your website. Every factor of On-Page SEO is controlled by you in your website’s interface. That’s why it’s important to do it correctly. Off-Page SEO is the set of factors that occur on other websites which improve your website’s position in the search engine results page (SERPs). Off-Page SEO concerns the promotion of your website on other sites in a variety of ways. For example, building links to it and promoting it on social media. Why is a User-Friendly Website Important for On-Page SEO? On-Page factors involve both the front end (the content) of your site as well as the backend (the HTML code). There are myriad elements that go into optimization. Before we get into the different on-page factors, let’s establish why a user friendly website ties them together. You can adjust things on your site until the end of time, but you won’t be successful until people consistently land on and continue to navigate it without bouncing off in the first 8 seconds. A user-friendly website encourages human engagement. If the front end content isn’t immediately appealing, user-friendly and relevant, most people will click away. This is why it’s important to flip a script in your head that may be saying “I need to make my website look good for Google.” You really need to make your website look good for people and Google will also respond well as a result. That being said, there is a full-on system to doing this that we are about to get into. 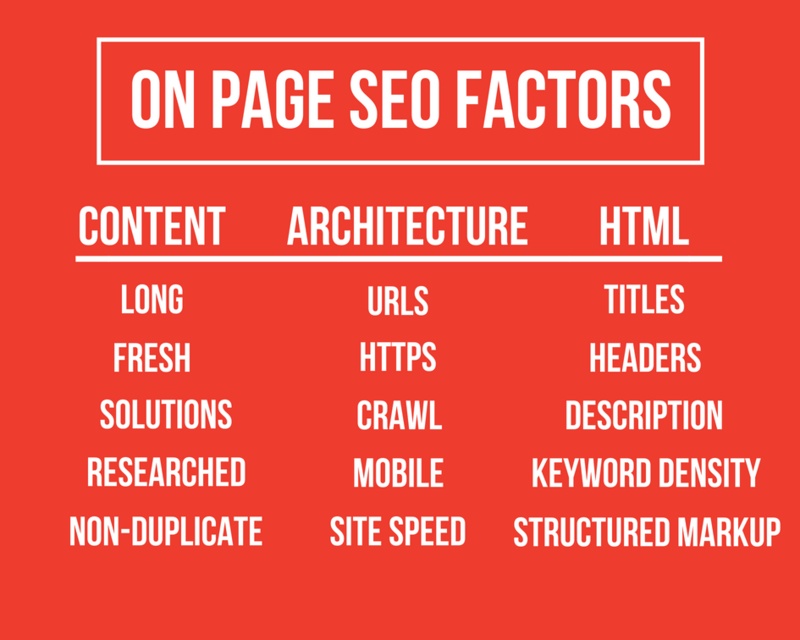 What Are the Major Factors in On-Page SEO? You can divide these factors into front-end and backend factors. Value — Is the content perceived as immediately valuable? This is reflected in things like your headline, topics, and images. User Experience — Does your site load quickly? Is it easy to navigate? Does it load and can it be easily used on mobile? Keywords and Content — Are your keywords and content optimized for search? In other words, do you include keywords and phrases that someone would actually search for on Google? Bot-friendliness — Is your data organized so that Google’s search engine bots can easily scroll your page and determine what it’s for? Metadata — Does your HTML include clues to your content’s purpose? Things like meta descriptions, URLs, and title tags play a role in this. 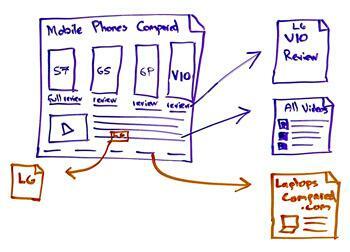 Mobile-friendliness — Is your site optimized for mobile viewing from a technical standpoint? 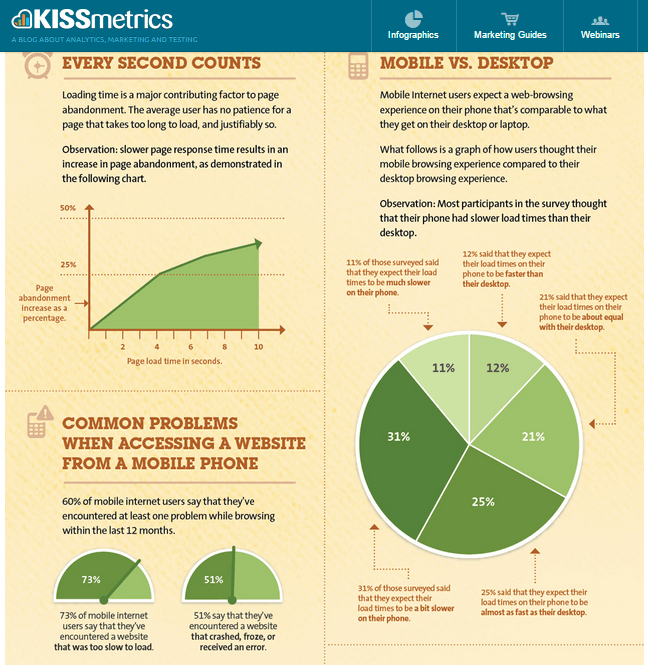 Is your site’s design responsive? Both the front end and backend of your website matter when it comes to SEO. Now we’ll get into the optimization of all these major factors. Starting with your keywords and content. To get success, you should do keyword research for your site and use it to create great content. You want high-quality content that Google loves AND converts your visitor into a customer. Your goal is to create a list of relevant keywords to your audience. Think of your website as a hub for the main topic that your target audience is interested in. To see what this looks like, use Google search to find questions your audience might ask. These questions aren’t exhaustive, so you’ll need to do more digging. If you start looking around for keyword research articles, you’ll find that each guide has different instructions. This isn’t necessarily because those different methods are wrong, there are just a ton of different ways to do keyword research. You can’t just use any keyword that’s getting volume and expect to rank, however: The competition presented by other sites varies widely depending on the keyword and market. 1. Put yourself in the shoes of your target audience. Let’s say you’re trying to promote an author’s self-development book about living the life of your dreams. Who could be interested in this book? Well, what groups tend to read self-development books? Business owners and fitness buffs come to mind, but those niches might be too broad to compete with. With some thought and market research, I narrowed it down network marketing business owners, who are women between the ages of 25-55. This is a customer avatar that tends to actively seek out self-development books. What does this audience want to know more about? What problem do they want solved? These are broad keywords that you can start with. If you try this as a starting point, you can start entering these terms into one of a few keyword research tools to come up with a nice list of keywords. Take note of long-tail keywords with four words that get search volume. You don’t want to use keywords that no one is searching for, but if your site ranks for many long tail keywords the total traffic that brings could be great. Some other commonly used tools for this purpose are Answer the Public and Uber Suggest. We don’t recommend using Google’s Keyword Planner to generate new keyword ideas because it’s really meant for advertisers to use on paid campaigns rather than for SEO. Don’t deduct synonyms from your keyword list. “MLM” or “multi level marketing” are synonyms for “network marketing” for example. As the list grows, you’ll be able to categorize keywords into bundles of different topics, search intent, and overall business value to you. This will let you plan your content strategically, which is the next step. Now you have a list of potential keywords and their search volume. It will probably look like some broad terms with a ton of volume at the top and some long-tail terms with smaller volumes. Now you can start to figure out their value to your business and the content that you should create for them. Your goal is to create the type of content that matches the intent of the searcher–whether it’s a product, an article, a video–or anything else. To do this, think of where the intent of a keyword falls on the customer buying cycle. Then, look up the types of content that rank for that keyword by typing the query into Google. By identifying the right type of content, such as an article, video, or anything else- you can make content that is more likely to rank. By lining it up with user intent, it will get engaged with. 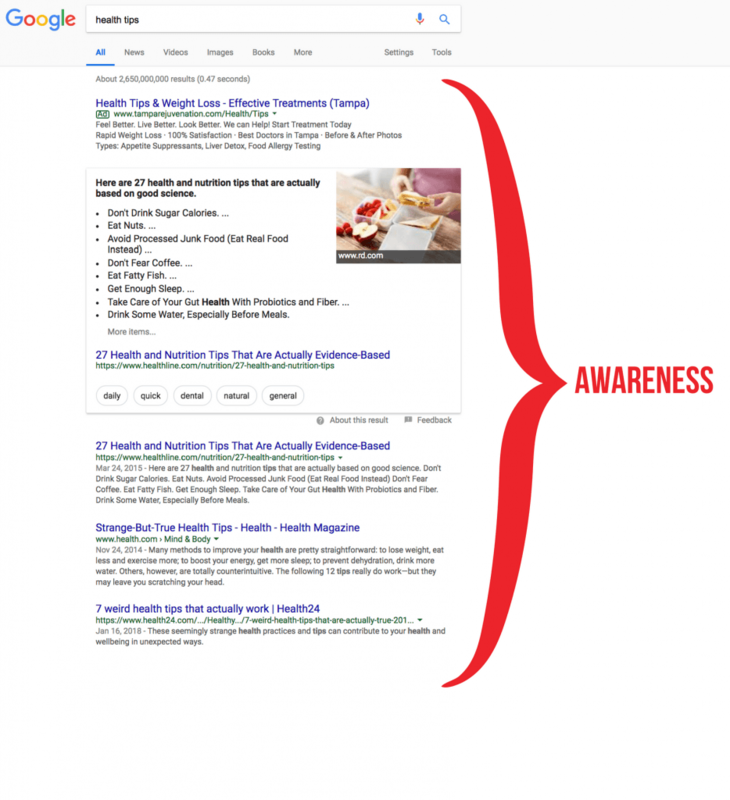 Searches like “on page SEO” or “health tips” indicate that a person became aware of something recently and wants to know more about it. …all help to identify the problem and start to build a relationship with your target audience. They aren’t ready to look at in-depth guides or a solution to buy yet. Searches like “how to do on page SEO” or “best supplements for heart health” indicate that a person is looking for solutions to their problem. This gives you an opportunity to narrow their choices for a solution to what you offer. …help to provide solutions while positioning your brand as an authority on the topic. Searches like “the HOTH seo review” or “best coenzyme Q10 supplement” indicate that a person is trying to be certain as to whether or not your solution and brand are the best. You actually start selling the thing on your website that makes you money in the content that caters to this stage of the customer journey. These are your most valuable customers because they are almost ready to purchase your solution. This is content that answers the question, “What are the next steps?” and makes it easier to buy from you. 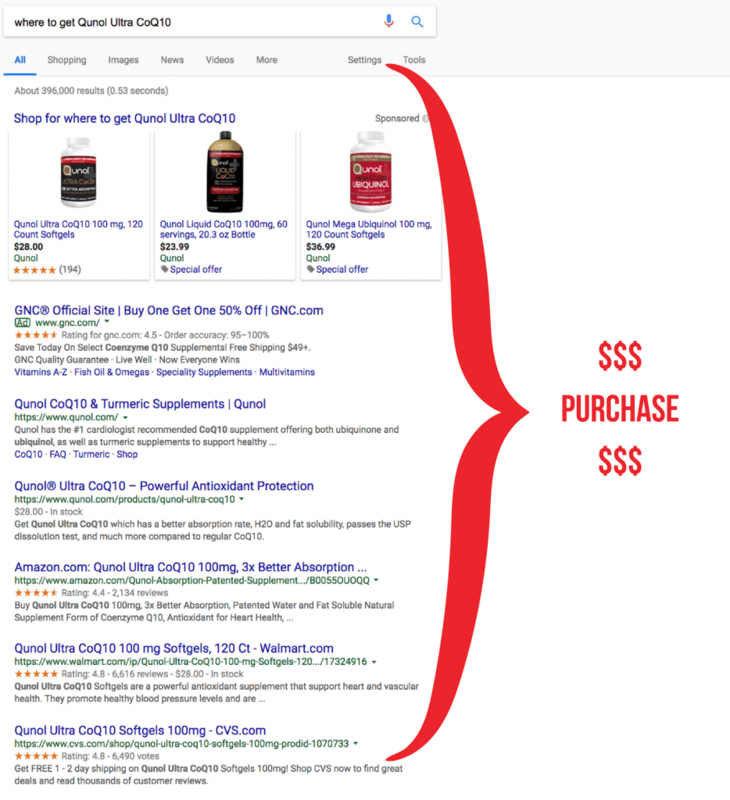 Searches like, “buy the hoth seo backlinks” or “where to get Qunol Ultra CoQ10” indicate a person ready to buy. Now you need to solidify their trust with your content that caters to this stage. These are your loyal customers who love your brand. It’s important to take care of them by creating content that caters to them. This stage gives you an opportunity to create content that upsells your loyal customers on a better version or different solution that your offer. Capturing them through search is less of a factor here because they are already aware of you and considering your solution. If you set up your other on-page factors correctly, they should be able to find you through search with most terms that include your brand name. Now you can start to rate the value of your keywords to your business by designating the intent behind them. To further evaluate the viability of your keywords, we recommend performing a competitive gap analysis of your competitors. This helps you further narrow down good keywords to use for your content. 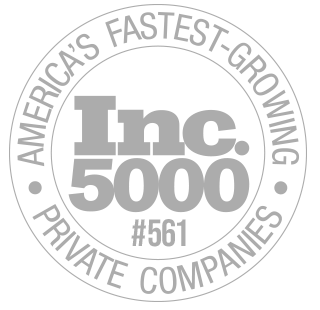 It’s similar to the process that we do to get great ranking results for our clients. You can learn how to do it in this article. Once you’ve further refined your list of keywords into valuable and viable ones to target, you can start to plan out the actual content that corresponds to it. I don’t need to remind you that your goal is to drive traffic to high-quality content. Content can take many forms as we’ve discussed above. So what are the criteria that make it “high quality”? Think critically about your content and make sure it’s truly useful. Look at other sites in your niche to see what content they have that’s bringing in traffic and conversions. One sidenote: Longer content isn’t *always* better. If someone is searching for Jessica Alba’s age and the top results are short pages of 100 words, your page should be a similar length. So be sure to check out the search results for your keyword before writing long content just for the sake of making it long. The other factor in regards to your content is that it should be fresh. This basically means that they weigh content as more relevant if it matches a search term that has become more popular in a relatively short time. For example, when the FIFA World Cup is 4 years away, not as many people are searching for it so you’ll likely get league websites as the result. When the World Cup is happening, the search results will likely contain a schedule of games, recent news and websites to stream the games on. As certain topics or questions become more popular and get searched, the increased search volume makes any content that addresses it more timely. It also means that lower performing content should be considered for an update to improve its quality and send a “fresh” signal to Google. As you use your list of valuable and viable keywords to plan your range of content, you’ll also be laying out your site structure. There is no “proper number” of pages that a website should have. You might plan certain pages around your most valuable keywords, but this isn’t always going to be the case. Before you create a page, think about whether you would still make it if SEO wasn’t a factor. A small local business might only need 5 pages on their site, while a more complex website could require 20 or more pages to compete in the SERPs. Let’s say you’re trying to compete with websites on the larger side: Remember how I mentioned that Google is looking for topical breadth and depth? Now that you’ve grouped your keywords into different topic clusters, you can think of those clusters as the topical “breadth” to plan out your content. If you have trouble manually grouping your keywords, there are more sophisticated tools out there like Serpstat or this one that can help automate it. Here’s a more detailed guide on to how to group keywords into clusters by how profitable they might be to you. The basic strategy for this is to create a set of extra high-quality “hub pages” which correspond to the different keyword clusters. Since The HOTH sells SEO, we know that learning how to do On-Page SEO is of big interest to our target audience. So we made this as an ultra-high quality page on that topic. We also have other pages on related topics such as eCommerce SEO, an alternative tool to Google’s Keyword Planner, and the link building service we offer: all content topics that may be of major interest to our audience. Make content around the subtopics associated with the different keywords in the same cluster and link those articles back to the hub page. The structure and quality of the content on all those pages gives you topical “depth.” For example, we linked other pages on our site that cover a narrower aspect of on-page SEO back to this hub page. Isn’t it cool that you did all that research? It makes it easier to plan out all the pages of your site. 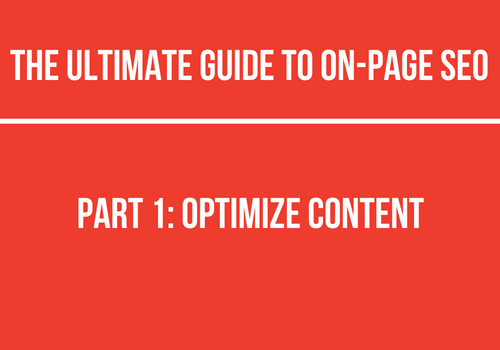 Now let’s talk about how to optimize the existing content on your website. At this point you have all the high level ideas around the purpose of your site, including: Who it is catering to, focus and LSI keywords, the range of pages, and their content type. With this information and planning, you can do everything else with much greater focus in mind. If you’re starting a website from scratch, now you have a blueprint to follow. If you have a site with existing content on it, you should check to see that all pages on it align with your purposes and goals. To do this, you should do an audit of your website’s current pages and content. Before you add any pages planned in the last step, let’s take away pages that contain thin or duplicate content, aren’t relevant, aren’t performing well, or simply aren’t needed. Load all of your site’s pages into a spreadsheet. You can do this by looking at your website’s backend or for an easier method, generate a sitemap using a plugin such as Google Sitemap Generator and paste that list of site URL’s into the first column of your spreadsheet. Add information on the metrics of each page to the other columns of your spreadsheet. More on those metrics in a second. Use that data to identify which pages are doing well, which pages have content that needs updating, and which pages have content that can be merged with other content or removed completely. Once you have sorted your pages, you can comb through and mark the action item for that page, whether it’s to “update,” “delete,” etc. Thin content are pages on your website that do not offer much value to the user. Google’s Panda update specifically targeted thin content for penalization, and their algorithm only continues to get better at distinguishing it from high quality content. 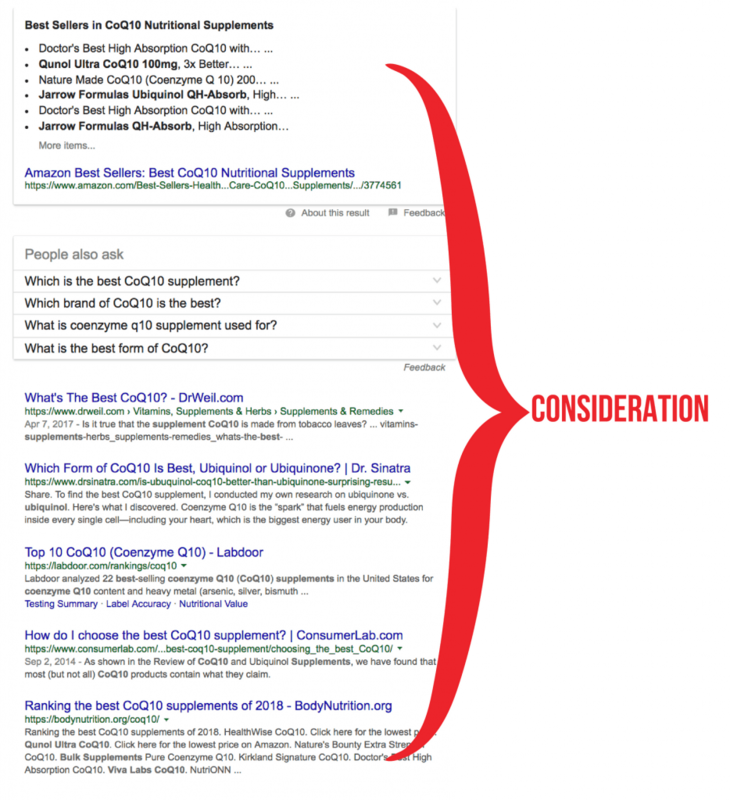 Thin content on your website will detract from its performance in the SERPs. We’ll talk about how to solve the presence of thin content on your site in a minute. Doorway pages that try to rank for a keyword to link off to other content. Pages with duplicate content on your site, or on yours and another site. Low quality sales or affiliate pages contribute to low quality ranking signals. A couple pages with thin content might not affect your rank, but too much thin content will hamper your site’s authority. It’s better to make every page great. Given that there are many factors that go into a website content audit, we strongly recommend that you start a spreadsheet to track it. There are tools available to get you started such as the Content Audit tool from SEMrush that pull information on your website and its performance to save some time. But you can also do the entire audit manually for greater control. 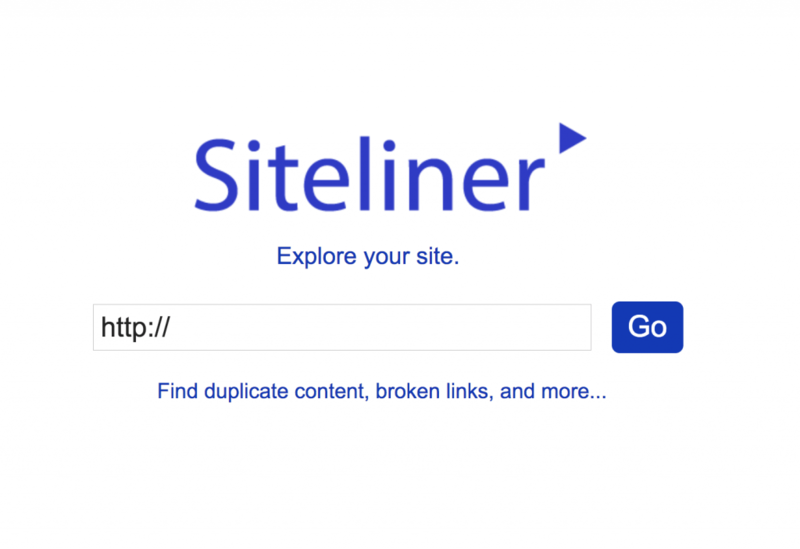 We’ve mentioned how duplicate content can be detrimental to your site. Yoast has published a great guide about duplicate content. As you did your site audit, you looked for duplicate content on your website. It’s also important to make sure that another website out there doesn’t have the same content on it without your knowledge. Check out our full guide to doing a content audit for your site here. 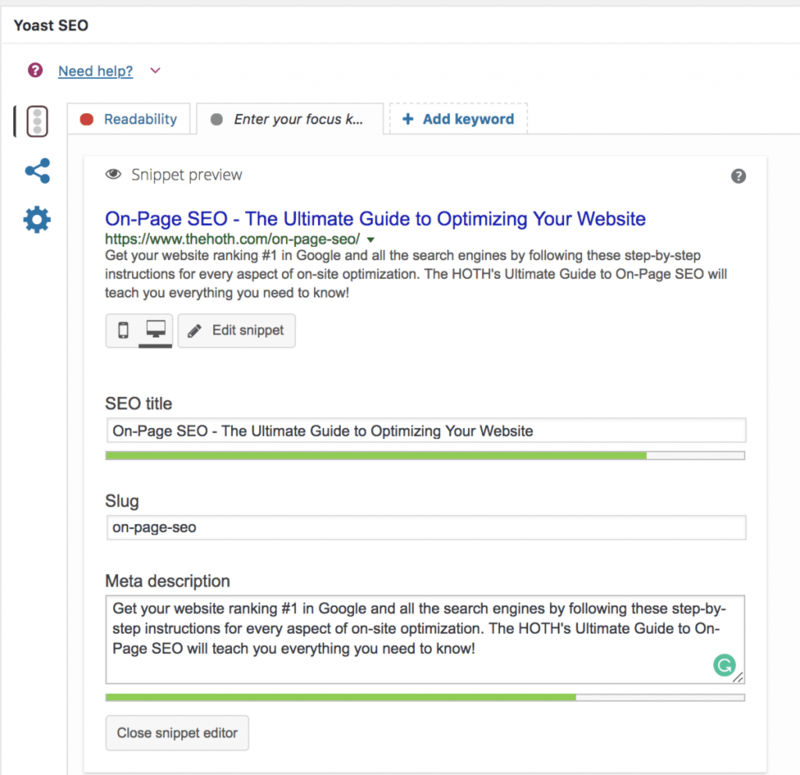 OnPage optimization helps people find your site’s content. Once they find it, you want to convert them into taking an action that benefits you. When someone lands on your webpage and does what you want them to do, you’ve just got a conversion. There are small conversions such as creating an account or signing up for an email list that may go on to lead to a bigger conversion of a purchase. To optimize conversion rates, you need to know what you’re optimizing for, where it is on your site, and who it is for. One thing that most conversions have in common as that the user fills out some type of form to complete it. This means you’re able to track it and get insights into how users are behaving on your site with Google Analytics. 1. URL Destination: When someone completes a form, they’ll land on the next page such as a “Thank you” page. This is the primary goal you’ll track. 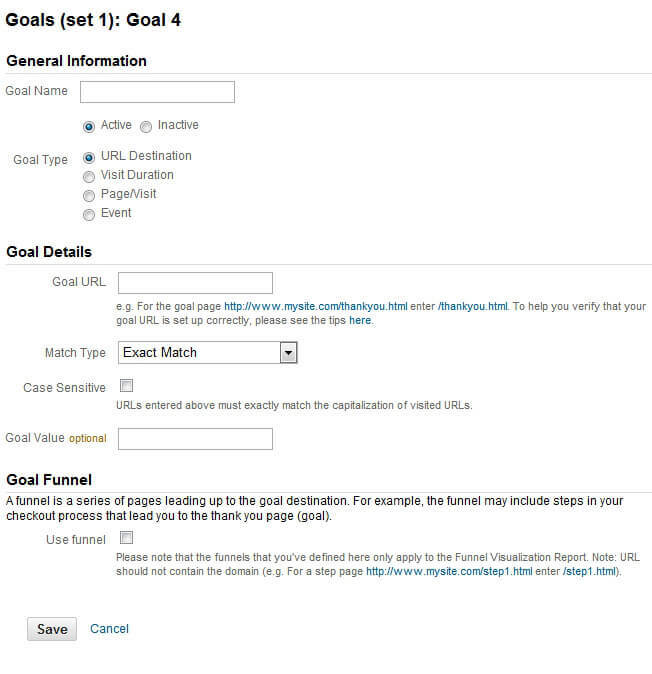 In the “goal URL,” just input the URL slug such as /thank-you/ (the portion of the URL after the domain). The data collected will tell you whether the traffic going to your site is converting. If you see that users are leaving your site after landing on it, you’ll know that your site isn’t keeping them engaged. In that case you need to adjust your pages further to meet their needs. 3. Pages Per Visit: This tracks how many different pages users to your site engage with. The right type of user for your site will engage with more pages, right? 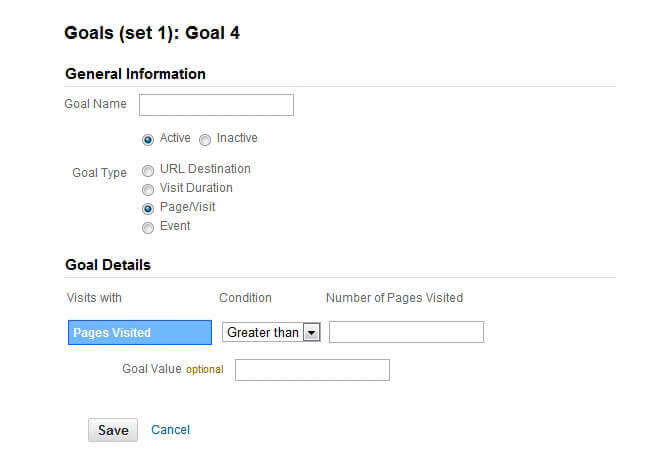 You’ll set up a custom goal for both Duration and Pages per visit (usually “greater than #”). 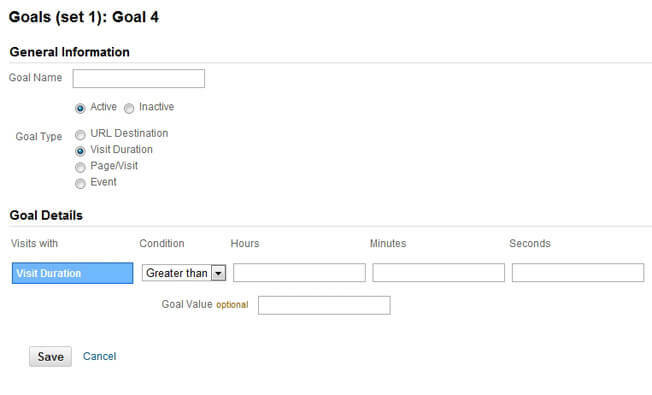 You’ll set the goal time or goal page number viewed you want to get a conversion from the user. Duration and Pages per visit are good to set up to track user behavior. The URL Destination goal is a bit more important because it actually tells you how many people completed the form. You’ll get the best data by tracking these three metrics in tandem. It’s important to understand the journey visitors to your website take and make sure to guide them toward the end result you want with your content. Number of leads – How many people entered their information on a page? Conversion rate – How many leads went on to buy after landing on this page? ROI – Based on how much money and time you’ve invested, are you getting a return (profit) on your investment? These metrics are calculated by you or tracked by your website platform. Using these criteria, you’ll be able to get a holistic view of how each individual page on your website is performing. 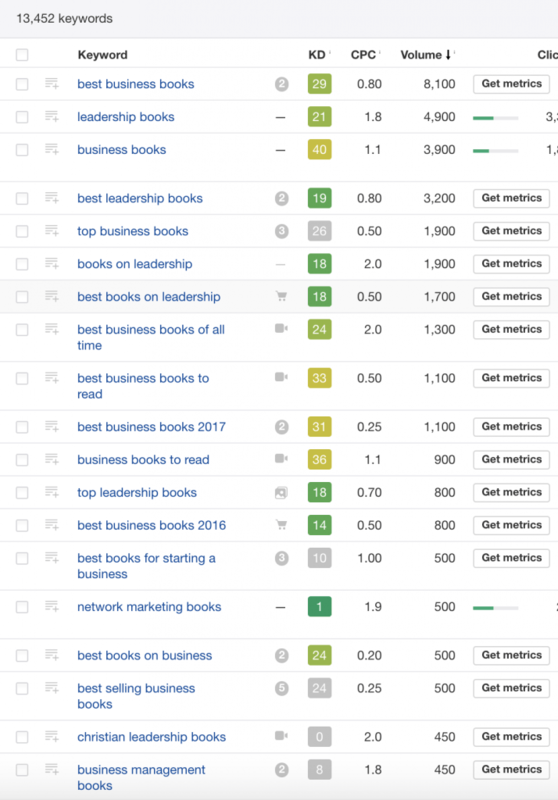 Then, you can use a spreadsheet to cross these metrics with other factors like the word count on the page, the number of backlinks to it, and other factors. This helps you determine whether the page should be updated for improvement, deleted, or kept as is. Now that your content is optimized for keywords, intent, and performance you can go on toward optimizing the HTML factors on each of those pages. 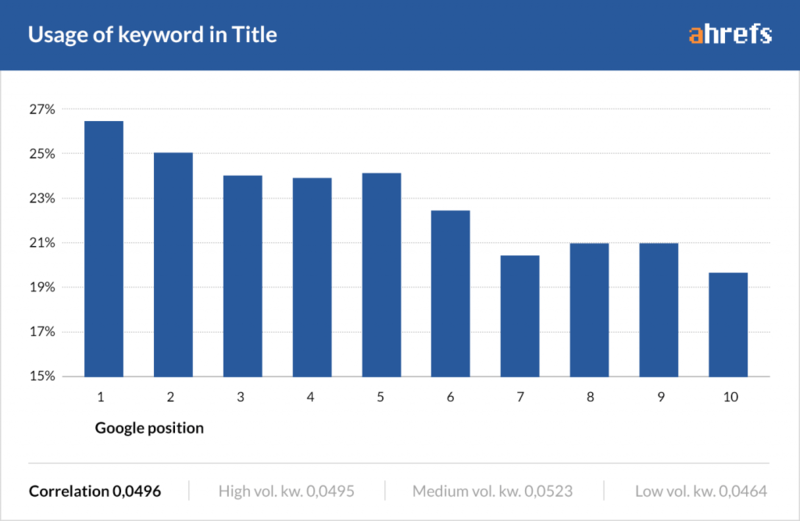 Meta Keywords — These are your LSI keywords found in your titles as well as throughout your content. Title Tag — This is the text that appears at the top of the SERPs, and is the SEO title of your page (it includes meta keywords). Meta Description — This is the text that appears below your SEO title on the SERPs and is a description of what your content is about (it also includes meta keywords). Meta Robots — This is your robots.txt file that shows search bots where to look for title tags, keywords, and meta descriptions. So how should you format your meta data? One of the way’s Google determines relevance is by using Latent Semantic Indexing (LSI) keywords. You should use LSI’s in your metadata when possible. LSI keywords are keywords that are semantically related, meaning that they are commonly found together or linked in some form. If you type keywords or phrases into Google, the keywords that appear are LSI keywords. Google uses LSI to prevent sites from spamming keywords in an effort to rank higher. If you were trying to sell a car, for example, Google would already have linked terms like “vehicle,” “used vehicles,” “buy used vehicles,” and so on. You don’t have to include all of those keywords in your titles for Google to know what you’re talking about. You just have to include a few. When it comes to how you write your titles, you want to include LSI keywords. You also want to add other modifiers that might help Google’s LSI system rank your titles. Modifiers are words that people add on to clarify or narrow down their search, like “2018,” “guide,” or “review.” Words like “how to” are also modifiers, and can help Google classify your titles. You want to avoid titles that are just a list of keywords and modifiers, however, since the LSI system is designed to penalize keyword stuffing. This is an example of a title with a relevant LSI keyword. BigCommerce recommends tools like Ahrefs and Google AdWords for performing competitive PPC analysis on the best LSI keywords for your titles. When it comes to doing keyword research for your titles and modifiers, look for low-hanging fruit. The two most important title tags you need to worry about are the H1 and H2 tags. In general, you won’t use H3 and on quite as much. 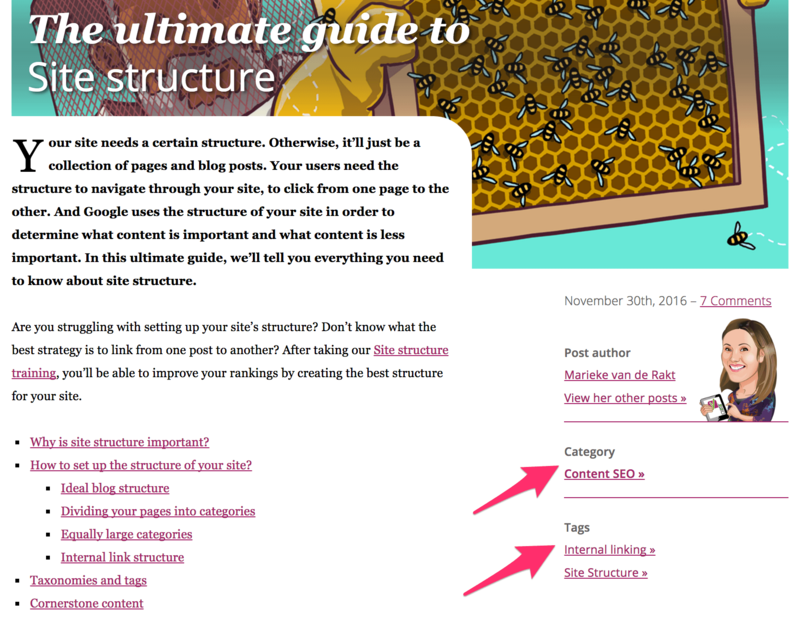 Add title tags using an SEO tool like Yoast, or if you know HTML code you can add them manually. 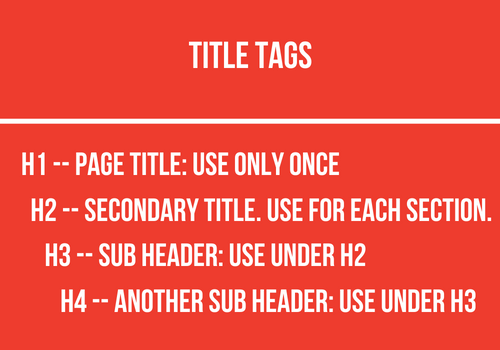 Keywords in your titles and subtitle tags are also important for users since titles are often the first thing that users will read when they land on your page. It shows them that they’ll find answers to the questions they’re looking for. These provide visual cues for your readers, and they tell Google’s search bots which keywords to look for first when they crawl your site. Google’s bots will look at the H1 tag for keywords first, and display them in the SERPs, so that’s why it’s so important to include LSI keywords in your titles. The organic CTR (click through rate) of your titles in the search results has a lot of evidence pointing to it as a ranking factor. 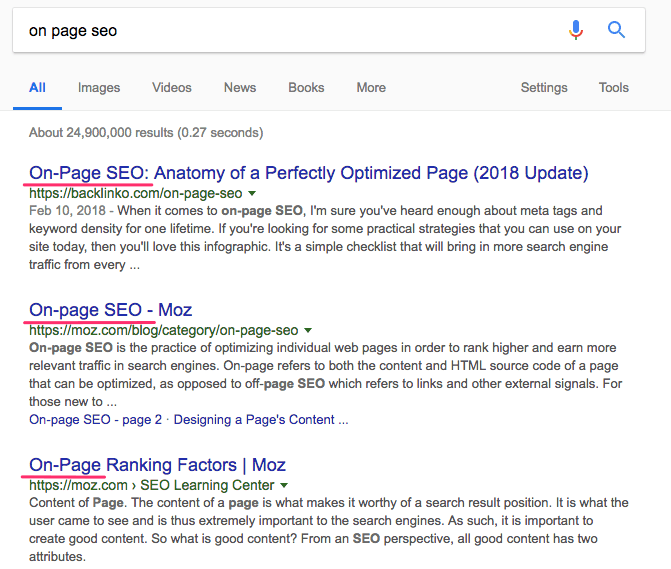 To sum up how to get a higher CTR on your titles: include your focus keyword in with a relevant long tail and/or modifier that tells the person that this is the exact content they’re looking for. In addition to your title tags, you also want to create meta descriptions. According to Kissmetrics, meta descriptions are somewhat less important than title tags when it comes to search engine rankings, but they do improve click-through for users. Meta descriptions should also contain relevant keywords, as they will be bolded by search engines when users type in keywords. 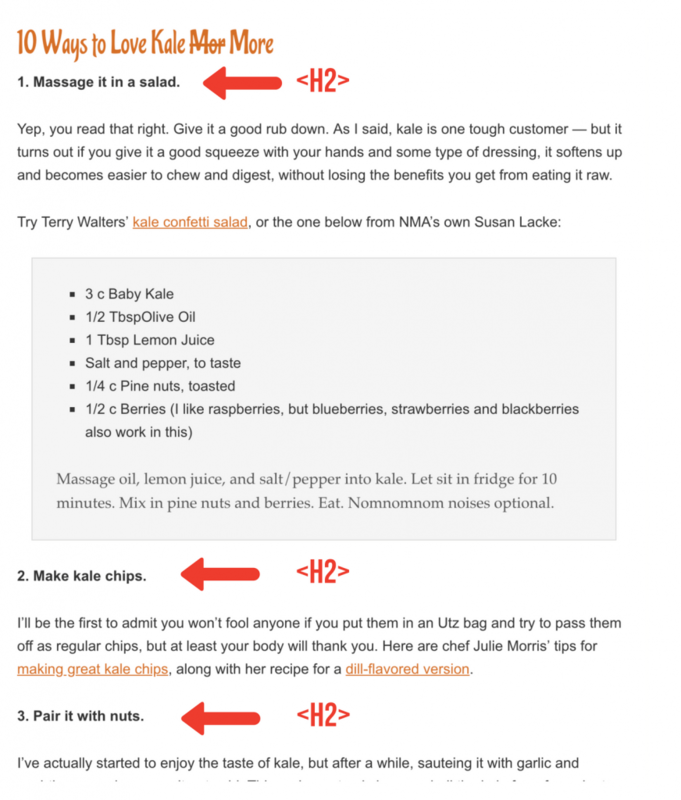 Subheadings, or the secondary sections of your content (like the section headers in this post), should be wrapped in H2 tags. This tells Google to look at your section headings for keywords next. Google will search for relevant keywords down the heading list until it winds up at your actual paragraph text, which it will then comb for keywords. Try using secondary keywords in your H2 tags to clue Google in to the relevancy of your content. 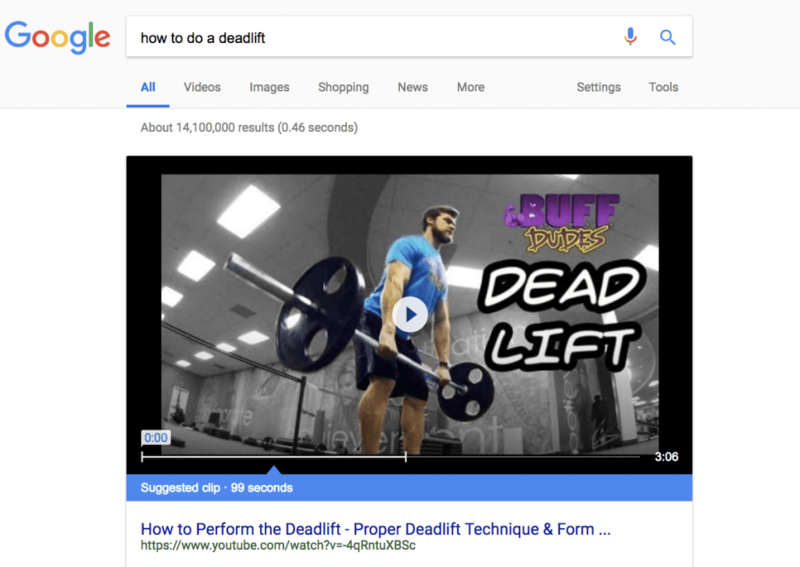 Why do some search queries result in a featured snippet? 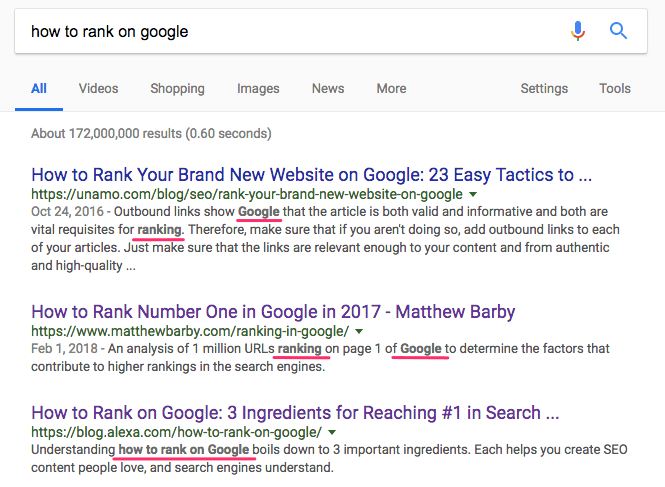 When Google recognizes that content on your page aligns with the information someone is looking for, a featured snippet bumps you to the #1 position in the search results without organically ranking for it. You already use structured markup to designate when a topic begins and ends in the content Heading tags like H1, H2 and so on. Even heading tags will sometimes result in a featured snippet, especially for a list-type article. 1. Ordered (numbered) and Unordered (bulleted) Lists. Google likes to see steps for doing something outlined as a list. The <ul> and <ol> HTML tags help to designate this data. Use the Table Press plugin for WordPress when you are using several metrics to compare data. By organizing this data and embedding it on your page using the plugin, Google may display the table right there for anyone searching. If you’ve ever noticed review stars next to a search result as a rich snippet, these are indeed a factor in getting clicks within the SERPs. They are also relatively simple to set up on your end. Rule number 1 is to be honest, don’t try to manipulate this snippet with reviews that aren’t real. We have a guide to getting more reviews here. 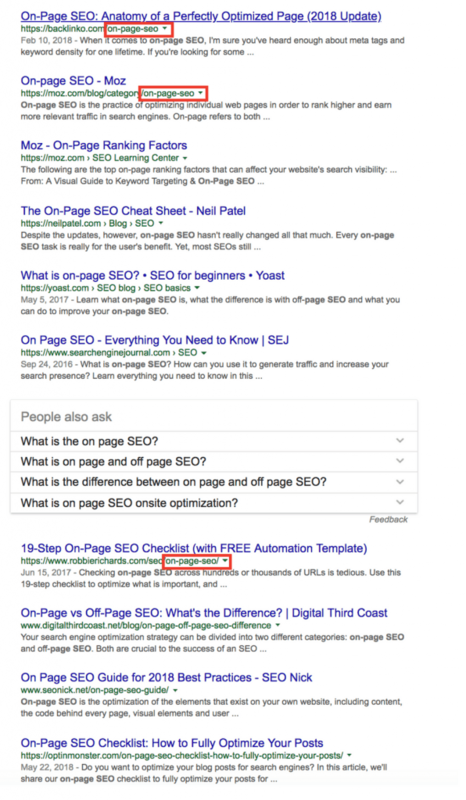 To have the review stars show up next to your content in the SERPs, use Schema markup. There is a good WordPress plugin for this called WP SEO Structured Data Schema that can help you implement the markup without too much trouble. 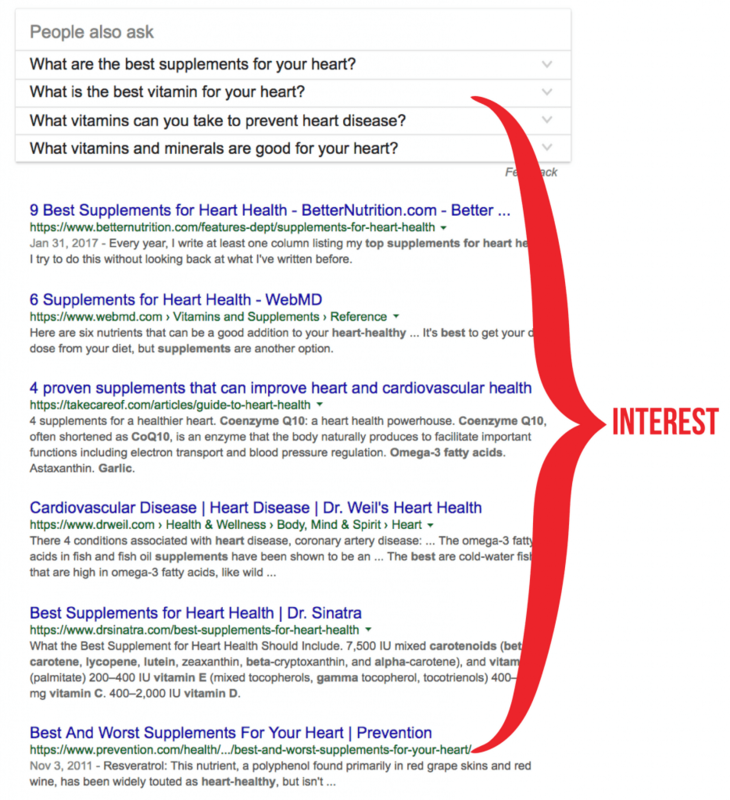 Your best chance at getting your content to appear in the featured snippet is to see what is currently showing up and make a similar version of it. 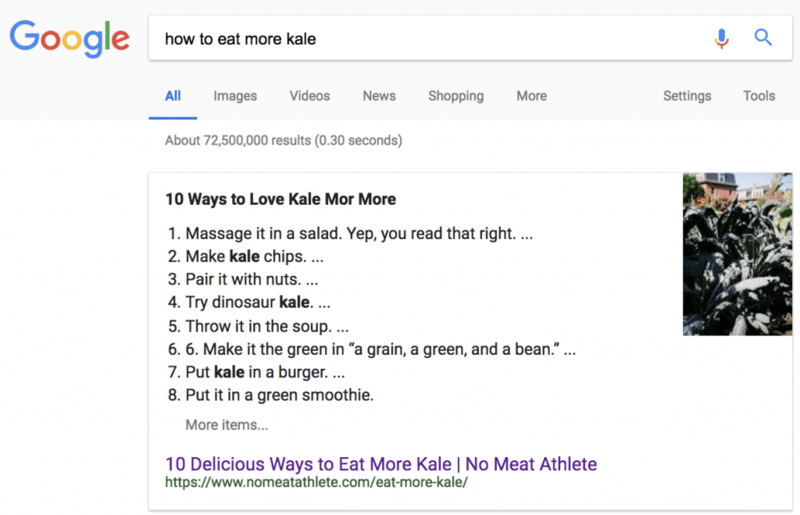 So if you wanted to compete for this particular featured snippet, you would be sure to mention similar methods to eat more kale and in a similar format. Each list item is a separate heading and section on the page. This is because people are gravitating towards video content for this query rather than written instructions. Makes sense, it’s easier to watch someone do a deadlift first before reading about it. In this case, you’d make your own video on the topic and post it on the same page as an article ont he same topic. It also helps to optimize the video for Youtube. 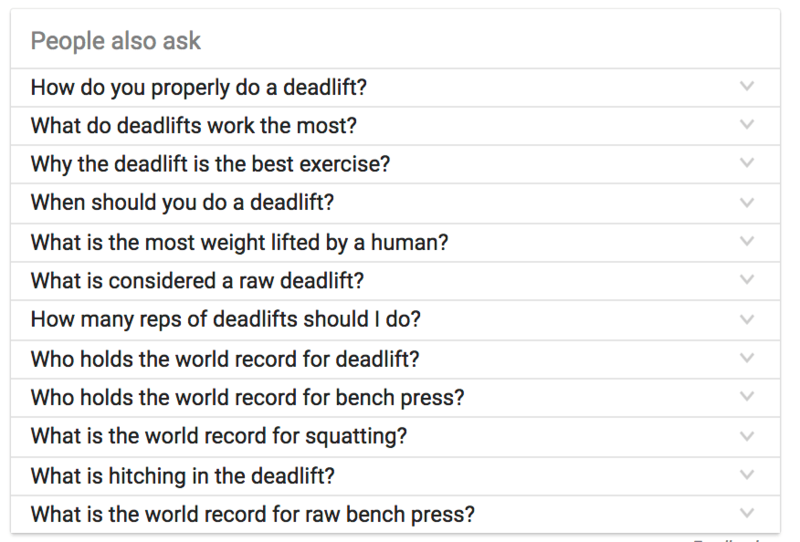 Google is keeping tabs on all the questions people ask about a topic, hence why we write for topics rather than keywords. So if you don’t get in the #1 featured snippet, you may appear as part of the next one down depending on the query. These examples demonstrate that snippets appear in different forms. The key to replacing a currently ranking snippet with your own is not to copy directly, but to mimic the content type (list, table, video, etc), the information, and the structure of that information on your own page. The risk of overoptimizing content is increased when you use too many of the same keyword on your page. There is no magical rate for the amount of keyword repetition to use on your page. Instead, focus on including the main keyword phrase several times, but not too many more than several. Individual keywords isolated from their entire phrase can be used more frequently. However, using their synonyms will make your content a lot safer from getting a penalty. Otherwise, your content risks being penalized by Google as part of the fix to their algorithm which occurred with the Panda update. Now that you’ve optimized your content’s HTML, we can talk about site-performance factors to make sure you hit on. Since everything here is tied in some way to user experience, it makes sence that your pages should load as quickly as possible, especially on mobile devices. When it comes to SEO, page speed counts. Google has said in the past that page loading speed is a ranking factor. More recently, they’ve amended their algorithm for mobile-first indexing. They’re now favoring sites that have faster mobile loading speeds, even for desktop searches. If you’re not sure where your site stacks up in terms of loading speed, you can easily check using Google’s PageSpeed Insights tool. And you can also test your mobile-friendliness with their mobile-friendliness tool. It’s important to test your site anytime you make significant new changes. New landing pages, images, and other elements might bog down your site’s speed without you knowing. Since you’ve already optimized your pages with metadata, now you want to focus on link building. The more high-quality backlinks you have from high ranking websites, the more Google likes your page. This isn’t about getting other sites to backlink to yours (an off-page SEO strategy), however. Internal linking is about improving the link equity of your own content. Link equity is like Google’s vote of confidence in your link building strategy. But when it comes to internal linking, you can create your own links that help your SEO. The best types of internal links are those that refer to other relevant content. For instance, linking to other blog posts from a blog post is better than linking to your home page from them. Anchor links are the most common (and easiest) way to create internal links in your content since they will appear naturally to the user as they read. But other types of internal linking, like a sidebar navigation menu on your blog, or your regular navigation menu, can also help. Like keyword stuffing, Google frowns upon too many links. They also frown upon having the exact match target keyword in the anchor text too many times, as this is associated with over-optimization. A guideline we try to follow is to find 2-5 quality internal links for every 500-1000 words in a blog post, in addition to any other navigational internal links that already sit on your landing pages. Another thing to watch out for are broken links (links that don’t work) on your page, whether internal or external. These harm your SEO. There is a WordPress plugin called Broken Link Checker you can install to monitor broken links on your site. There is a very easy way to determine the URL for a piece of content on your website: Look at the URLs of similar high ranking content. Other guides might have different slugs, but since this is the simplest and most frequently occurring in the top results, it’s a safe bet for our own guide and is what we’ve chosen. 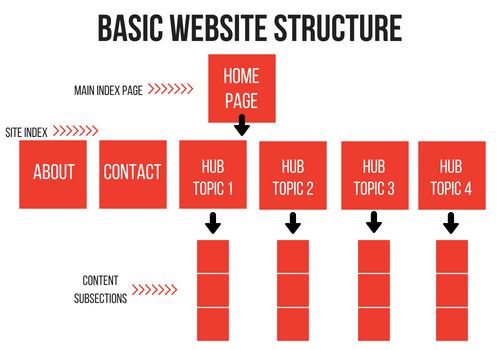 In terms of URL structure: hub pages are generally linked to from the homepage and may appear in the navigation menu. Other articles on the site that link back to these hub pages will often be in the company’s blog. The mark of an SEO-friendly URL is its keywords. Including keywords in the title of your URL, in comparison with an “ugly” URL that contains things like numbers and symbols, can make the difference for ranking on search engines. In fact, Google’s former head of search quality, Matt Cutts stated in an interview that keywords in URLs were an important part of ranking. But he also said that the most important keywords should be added near the front. According to Matt, the ideal length of an SEO-friendly URL is around 4-5 words, with the algorithm giving less weight to keywords added in after the 5th word. In other words, keep your URLs short and sweet, and use keywords near the front. 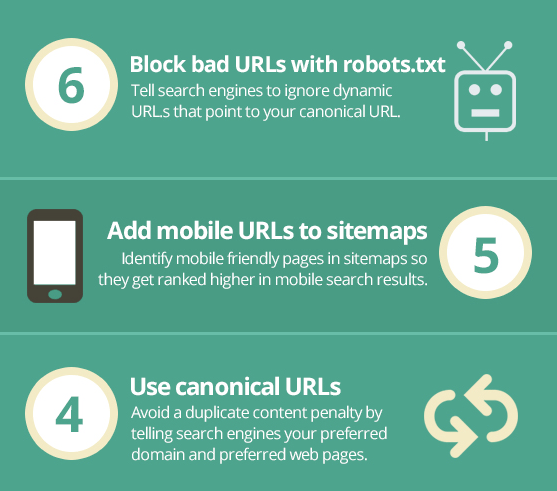 There are also some things you want to do on the backend to help your URLs rank better. This includes adding a robots.txt file (a file that tells search engine bots where to look for content), including mobile-friendly URLs in your sitemap, and adding canonical dates to your blog URLs. By optimizing your URLs, you not only tell users what your site content is about, but you’re telling search engines like Google how relevant and valuable your content is. When bots scroll your site, they’ll be able to help you rank better based solely on your URL structure. It’s a strategic but often overlooked element of SEO. In 2014 Google’s Webmaster Central Blog formally announced that a secure website is a favored ranking signal as part of their push for HTTPS Everywhere. At the time, HTTPS (HTTP over TLS-Transport Layer Security) was described as “a very lightweight signal” that carried less weight than high-quality content. This came with the added note that Google may eventually decide to strengthen the weight of this factor to encourage website owners to swtich from HTTP to HTTPS. Today it’s pretty much a given that you should implement HTTPS to secure your website. Even if HTTPS isn’t strong enough to push your ranking over the edge, it’s definitely a factor not to be overlooked in your holistic approach to optimization. Websites that adopt HTTPS are favored because Google wants their users sent to safe and secure websites. Google’s Chrome browser is even set to designate non-HTTPS sites as unsecure as of July 2018. To get HTTPS on your website, you’ll need to set up an SSL certificate. Here is a guide to implementing an SSL certificate on your site. It’s a bit too long to describe in detail here. Host your website on a dedicated-rather than shared-IP address. Activate the certificate. You can carefully do it yourself or see if your web host can set it up on your behalf (recommended). Install the certificate. This may be done by your web host but is an easier step than activating it. Update your site to use HTTPS. This is especially crucial for pages like shopping cart, checkout and login where your website user’s information is captured. We recommend either following a guide or getting help from your web host or a trusted developer to make sure your SSL certificate is properly installed. For SEO purposes, what you do on your pages is just as important as what you do off of them. 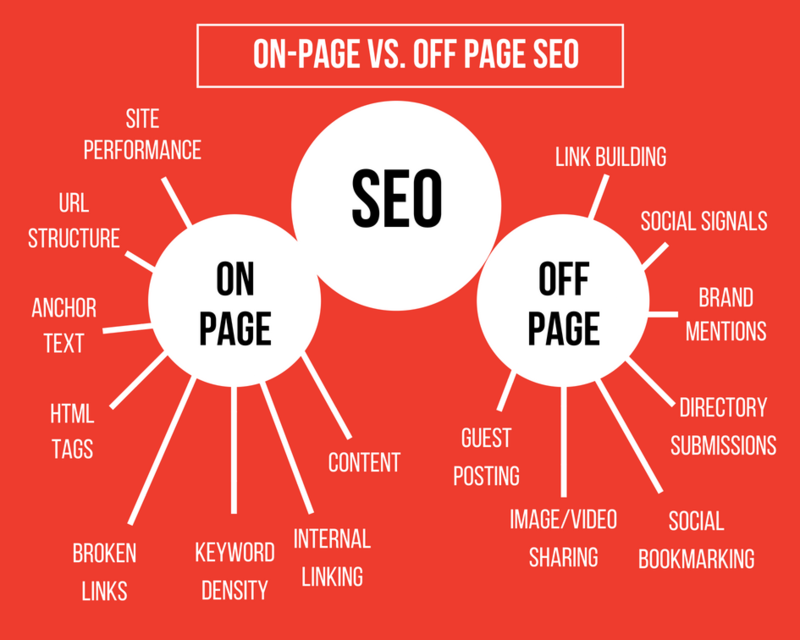 On-page SEO ultimately boils down to value and user experience. The more you can do to add value to your site — like adding internal links, relevant LSI keywords and meta tags — the better the experience will be for users as well as Google’s search bots. You also want to ensure that bots have an easy time classifying your site. By doing things like optimizing your titles and URLs, as well as improving your site speed, you can make Google’s job easier and help with your ranking in the process. Making a truly great website full of pages with high-quality and optimized content is a formula for success. If this process seems daunting, just take it piece by piece. It might be some work, but the results will be worth it. Short on time but want to fix your site’s onpage elements? We also offer a product for that here. Need any clarification? Have any additional comments to add? Leave them below! Thats a massive article guys! So in depth and detailed! Well done! OnPage SEO can be painful, and as we can see here there is a lot that needs to be done for perfect onpage seo. Thanks a TON for the kind words Scott! Good info and knowledge-sharing. Mantra Yoga is ranking at the top with Ashtanga Yoga teacher training in India due to applying Hoth ideas. Nice, great that you’re having success as a result of our guides! Hello thank you for the great article on On Page SEO, it’s so in-depth. I will certainly be referring back to this when going through a revision of my website. There were a few areas of optimization mentioned I was not aware of. Glad you found it helpful Gerard! Well I must admit, it’s refreshing to see another decent article that fully explains the Pro’s and Con’s of On Page Seo. I have implemented quite a few of these methods from your previous articles but there are also very many that I can see will benefit my customers who need extra ranking help in this article. Thanks so much for the kind words Francis. Every bit helps with on-page optimization. Amazing piece of content. Printed and ready to improve my blog. Awesome to hear that this was print-worthy for you Ruben! Best of luck optimizing these factors! Awesome.. I have never read an article about On-Page that was longer than this..but lots of innovative info which I need since SEO is the hardest thing for me to do! Thanks for sharing some on page SEO techniques i hope it’s helpful for my blog. Great post! 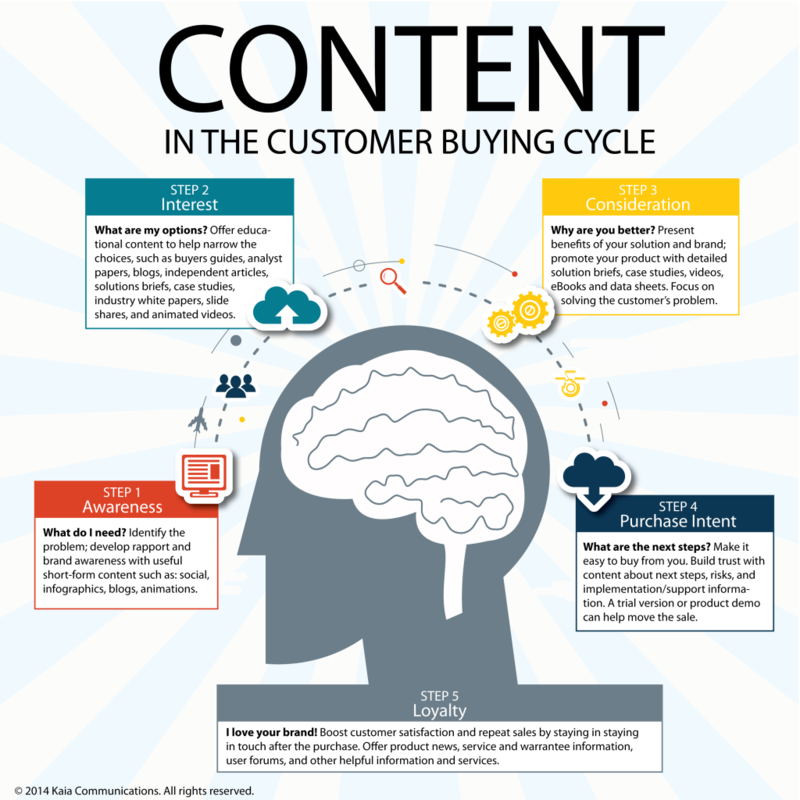 The infographic gives a great visual guide and the content is amazing! I really liked your pointer about including modifiers, and also the pointer about checking if a theme has the H1 title tag. I just assumed all of them did, but you learn something new every day. 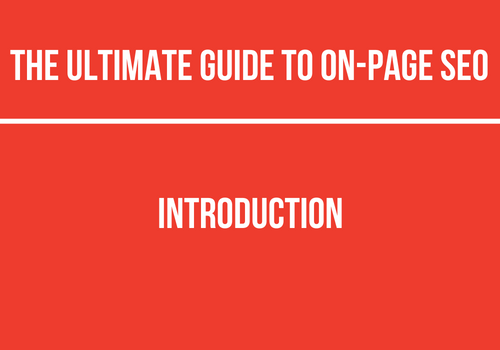 Wow, this guide answers almost everything about SEO. Glad you like it, Rahul! Great Article, love to read these useful tips…..